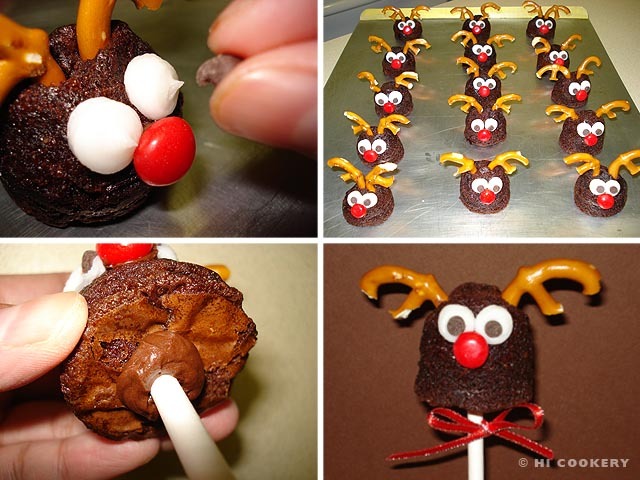 With Christmas right around the corner, we got in a merry mood and made Rudolph the Red-Nosed Reindeer brownie pops for National Chocolate Brownie Day! We used a brownie pops silicone mold to bake basic brownies and decorated them as the most famous reindeer of all using frosting, chocolate chips, pretzels and red cinnamon candies. 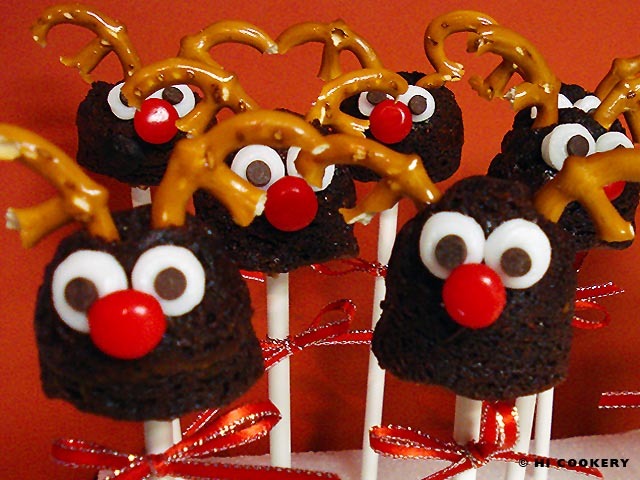 Share these Rudolph brownie pops with others at holiday get-togethers and you, too, can go down in history as the host/hostess with the most/mostess creative Christmas confections! Lightly grease the cavities of the silicone molds. Mix the brownie batter according to the directions on the package. 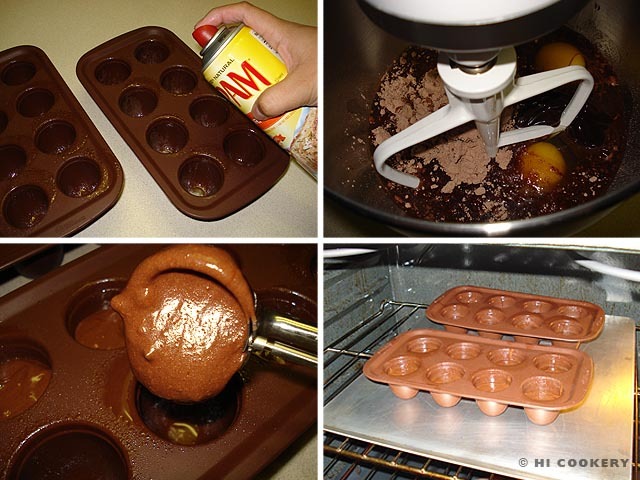 Fill the silicone molds with brownie batter. Bake in the oven following the directions on the brownie mix package. Remove from oven and let cool. Carefully cut the pretzels to make the antlers. Dip the ends in chocolate frosting and insert into the brownie. Pipe the eyes using a small round tip on the white icing tube. 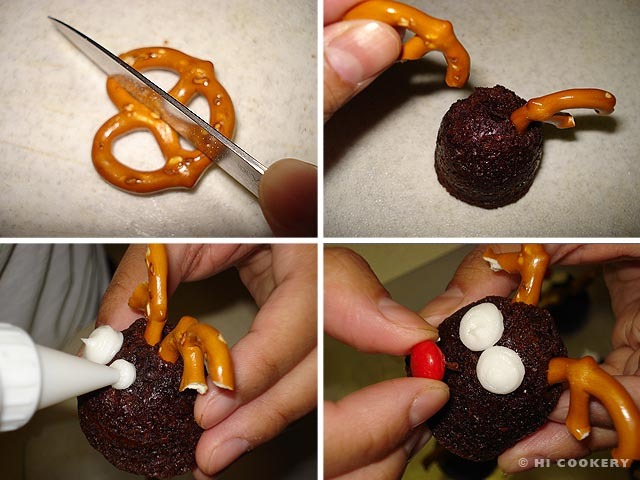 Dab a little chocolate frosting on the back side of a red round candy and place the nose underneath the eyes. Add the mini chocolate chips on the point of the white icing of the eyes. Rudolph brownies may be served on a tray at this point but can also be made into pops for a pretty presentation. Dip the end of a lollipop stick in chocolate frosting then insert it into the bottom of the brownie. Stand the Rudolph brownie pops on a piece of styrofoam. Tie a ribbon on the lollipop stick for a festive touch. Listen to Burl Ives sing “Rudolph the Red-Nosed Reindeer” in a YouTube clip in the finale of the Rankin/Bass childhood animated classic 1964 TV special here.